Ground resonance was the subject for the Vertical Flight Society's University of Texas at Arlington student chapter's meeting on October 1, 2018, presented by Mark Dreier, an adjunct professor at UTA and consultant for the AVX Company. Mark presented a mathematical model of a helicopter rotor system and laid out the fundamentals of how resonance can be created between the rotor and fuselage. Mark's model and simulation showed students, many for the first time, the effects of ground resonance and some design characteristics to consider in the future. 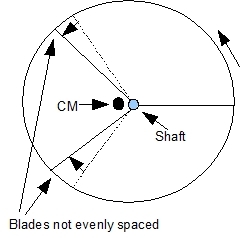 Ground resonance is an imbalance in how the helicopter blade, or rotor, rotates. This throws off the rotor's center of gravity. Ground resonance causes the helicopter to vibrate severely and can lead to significant, even lethal damage. One method of reducing ground resonance is to get the helicopter into the air.